Whether you cycle for pleasure or to get in and out of the office without having to face the horrors of public transport and rush hour, there’s no denying that it’s never been cooler to “get on your bike”. The UK’s cycling success at the London 2012 Olympics spawned a new, country-wide passion for pedal power which has gripped the UK like a pair of lycra shorts for the past four years. This is a smart, simple beauty of a bike rack, which even has room for your books! Crafted from blue-streaked pine beetle kill wood (deemed unusable in other contexts), it’s also an incredibly sustainable option – great if you’re serious about doing your bit for the planet. 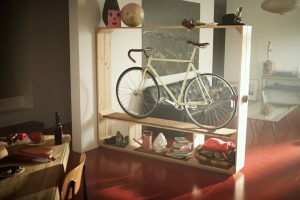 Glorious Scandinavian design and admirable multi-functionality – this elegant indoor bike storage solution makes your transportation look like a work of art! Made from simple ingredients including steel, screws, fir and coconut fibre, with an impressively strong clamp to secure your bike, this indoor rack takes bicycle storage to the next level. 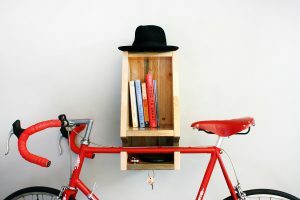 For the true cycling obsessive, these beautifully simply (yet somehow simply clever) upcycled bike racks are a must-buy. 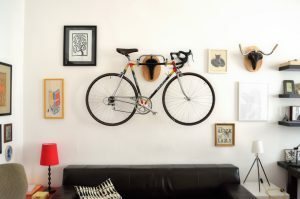 Made by Austrian designer Andreas Schieger, these beauties look like hunting trophies from an extremely unusual Tour de France – and they work fantastically as bicycle racks when combined with some sturdy support. Do you keep your bicycle indoors for security? Does it stay propped against a wall or do you have a mount or rack to keep it in great nick? Share your picks and your preferences with other readers below.